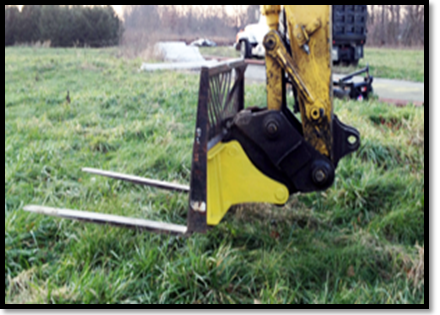 How many times have you thought about using your skid steer attachments on your excavator? How many times has your skid steer been unable to complete a project because it did not have the reach necessary? Been there, done that. Now we have come up with the solution to allow your excavator through our universal plate to do the work of 2 different machines. Now your excavator is a forklift, a harley rake, a drill, a trencher, a root ripper and any other attachment you have purchased over the years. Our heavy duty 1/2" steel plate gives you the flexibility you have only dreamed of. We can fit any size hanger and pin combination to the plate to fit your specific coupler size. The large easy to slide pins make hook up and removal a breeze. We have 3 simple ways to get started (1) go to our web site excavatingsolutions.com and fill out the easy to follow pin form. (2) send us an e-mail or (3) give us a call. (317) 210-0220 We will provide you with a timely estimate and impressive turn around time to keep your equipment out in the field operating efficiently. Please view the video below to explore the revolutionary products and designs we are providing to the excavating world.